A few days ago we posted Part 1 of a slightly different take on our usual review format; a direct comparison between Studio McVey's Sedition Wars and Mantic Games' new Deadzone. Both are 28mm hard sci-fi skirmish games, and whilst both are heavily rooted in the tabletop side of hobbying, both are also advertised as being able to run straight out of the box. To us, that allows them to be hit with the board game tag (even if only loosely), since the very nature of any board game is that you can open it up, play the game, and pack it all back into the box and shelve it when you're done. Se﻿dition Wars contains a whopping 50 miniatures, which we mentioned in Part 1 may be a slight concern due to the inevitably long assembly time. We were also a little concerned about the amount of unsightly flash and mould lines on the models, as these would only further add to this. However, as it turned out, neither of these were particularly troublesome! There were no assembly instructions for any of the minis, and most of the Vanguard (human) models consisted of 3 or more parts, but they were bagged up in small groups and it was fairly obvious which parts matched up with which models. We should stress at this point that enthusiastically tearing open all of the bags and upending them into the box would be a very bad idea! Open one bag at a time, assemble those models, and then move onto the next bag. When it came to The Strain (mutants) on the other hand, many of the models were cast as a single piece, cutting assembly time down significantly. The larger Strain models were a little more complex, but once again the parts matched up in a nice, clear way, and there were (almost) no real issues in putting them together. Okay, we said "almost". The only issue was on one of the larger Strain models (our favourite model, actually!) there was a pretty bad miscast, which meant that two of the parts didn't fit together properly. We did the best we could with it and used modelling putty to hide the damage, so when painted up it should still look fine. This will, sadly, be a mark against Sedition Wars when tallying the final scores, as the requirement of slightly more advanced modelling skills, tools and materials does defeat the point of a game which can be played straight out of the box. As it appeared at first glance, there was a fairly decent chunk of flash on almost every model, but these were very quick and easy to remove with a pair of clippers, and the mould lines were easily removed by tracing a modelling knife around the edges. The only casting issue we had in Sedition Wars can be seen clearly on this model. A touch of modelling putty from The Hobbynomicon's Citizen Williams managed to straighten him out though! ...and their higher levels. These are particularly nice, with the two on either side having a very Resident Evil feel to them. Two of The Vanguard's main characters - the sniper is our personal favourite out of the humans. ...and the other two main characters. The Vanguards' grunts - with both standard and heavy weapons - and a handy little hovertank to bring some heavier firepower. By comparison, Deadzone is fairly model light, containing only 23 miniatures in total (actually ours contained 24 as it included a limited edition not shown here, but the standard box will contain 23). Once again, no assembly instructions were included with these miniatures, but they were bagged up in loose sets, so again we make the recommendation of assembling them in batches, rather than trying to tackle the whole set at once. The Deadzone models were blighted with the same unsightly mould lines as their Sedition Wars counterparts, but were just as easily tidied up with a modelling knife. Unlike Sedition Wars, all models in the Deadzone set consisted of several parts. This allows for more dynamic posing on the miniatures, but the downside came in trying to match the parts up. The Enforcer (human) faction was especially bad, with several arms being bodged together quite sloppily, and by the end of it we were left with more than one miniature which we'd be embarrassed to be seen playing with. We have since learned that this is down to Mantic not being happy with the plastic Enforcer sprues and so issuing some of their old resin ones instead, with the intention of rolling out the plastic models next year. This does mean that any Deadzone boxes bought in the initial wave will suffer from this same problem, so it might be worth talking to your FLGS as they may be able to secure you some complimentary replacement enforcers upon their release. As with the miscast in Sedition Wars, this is going to be a mark against Deadzone, as it does effectively mean the box contains an imcomplete product. The Plague (mutants) on the other hand, are a delight. The pieces fit together nice and clearly, and the detail is exquisite. One other nice thing about the Deadzone box is that whilst there is very little customisation available in the models, no two are alike. All are designed to have their own unique poses which help to identify similar units on the battlefield, and also make your squad look as though it really is comprised of individuals. Due to the assembly issue with The Enforcers, the Deadzone miniatures actually took longer to build. Again, we weren't clock-watching, but with two entire evenings lost to assembly, it can be estimated that these 23 models took somewhere in the 10-12 hour region to put together. The Enforcer leader, with a couple of additional special units and some gun turrets. The rather delightful Plague leader. Some of the Plague grunts. The Plague's larger units, in various dynamic poses. 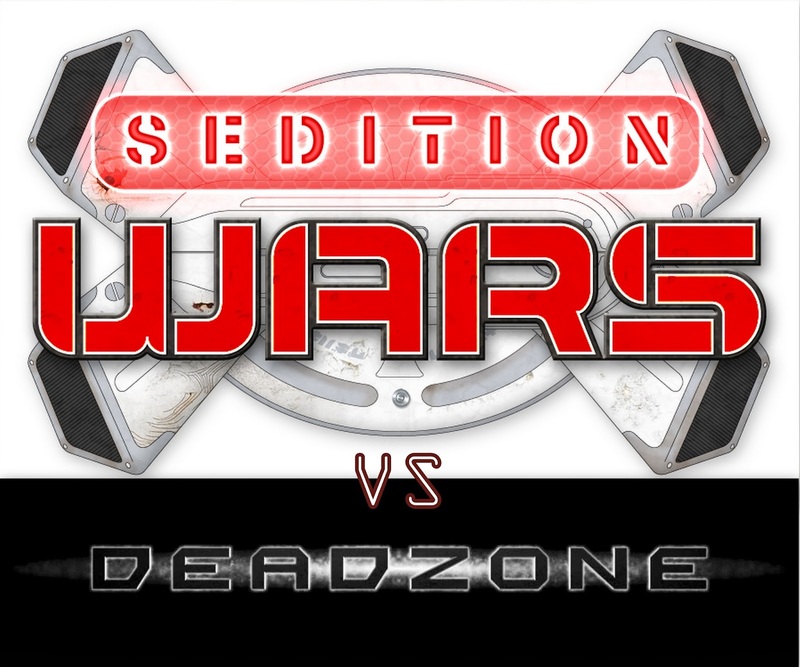 We have to say that on the assembly front, Sedition Wars does beat Deadzone by a small margin. Both sets have some fantastic models, and both sets have flaws, but Deadzone more than Sedition Wars. This results in a more enjoyable and quicker assembly process for Sedition Wars, even in spite of the greater number of miniatures. So now that both sets are assembled, we can finally get onto playing some games! We're hoping to have at least a couple of models on each side painted up before the final part of the review goes up, to make the photos look a little bit nicer if nothing else. Come back in a week or two and see how the two systems fared! Glad you're enjoying it, unfortunately Part 2 is on hold for a while until I can actually find someone to play either game against! I had the same issue with my large strain figure. Instead of using putty, you can put the miscast piece in some hot water for a minute or so and then bend it to get a near on perfect fit. Betfair is one of the largest betting exchanges in the world, as well as a superb platform for trading both sports and games. The concept of sports trading is frequently being discussed in articles, forums and blogs across the web - but not everyone knows that it's actually quite possible to make trades on traditional casino games - via Betfair Exchange click here. Betfair Exchange Games is an integrated part of the Betfair website and currently features seven different games with new ones being introduced from time to time.